Cook farro according to instructions. Peel and cube the squash. Coat with olive oil and salt and roast at 400F for about 30 minutes. Flip halfway through cooking time. Zest the lemon and set aside. Add the dressing ingredients to a jar and shake until combined. 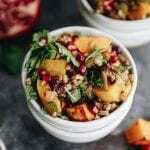 Add cooked farro, roasted squash, pistachios, dates, currants, olives, pomegranate seeds and lemon zest to a big bowl. Add 1/3-1/2 of the dressing and toss to combine. Add the herbs just before serving and toss once more to combine. *This salad can be made a day ahead by leaving out the pistachios, dressing and herbs, adding those right before serving. Cover chopped herbs with a damp towel/paper towel and store in an airtight container.